RainBird 1800 Pop-up Series Spray Bodies are built for reliability and versatility, with heavy-duty materials like the stainless steel retraction spring and co-molded wiper seal and a wide selection of options to fit all your needs. The 1800 Series has first-rate quality built in for reliable operation and long life. The 1800 series superior components and features make the spray body a popular choice around the world. 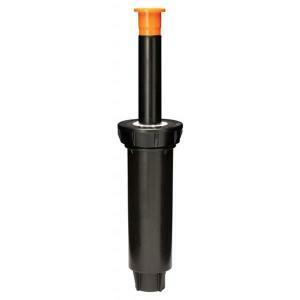 RainBird 1800-SAM (seal-a-matic) Series is ideal for use in areas with changing elevations, up to 14' of head. The built-in SAM check valve saves water by eliminating low head drainage from spray heads located at the base of slopes or hillsides. RainBird 1800 SAM PRS Series includes the seal-a-matic (SAM) feature and built in 30 PSI pressure regulator. This model provides consistent pressure for optimal operation of your selected spray nozzle. Great for use in any area with varied pressure and/or elevation changes. Restricts water loss by up to 70% if nozzle is removed or damaged. RainBird 1800 SAM P45 Series is ideal for use in areas with high and/or widely fluctuating water pressures and steep slopes. This built in regulator maintains the nozzle pressure around 45 PSI for optimal operation of Rotary Nozzles with system pressures as high as 70 PSI. When used with Rotary Nozzles, this combination improves performance and saves water (up to 65% savings). *Please Note: Spray Nozzles not included. Must purchase separately.